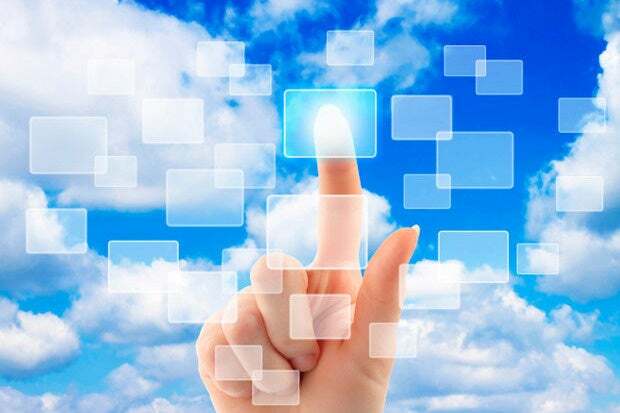 In early March I reviewed the AWS Mobile SDK, Google Firebase, and Microsoft Azure Mobile Services, the mobile back-end service offerings of the three major public clouds. The Microsoft option was a pleasant surprise. I was struck by Microsoft’s thoughtful implementation of mobile services and the respect with which the Azure Mobile Services team addressed the needs of app developers without imposing on the choice of solution; thus, we awarded it an Editor’s Choice. Apparently Microsoft has a “full employment for freelance reviewers covering Azure” policy, because the company has already introduced a new level of back-end integration for Web and mobile services. 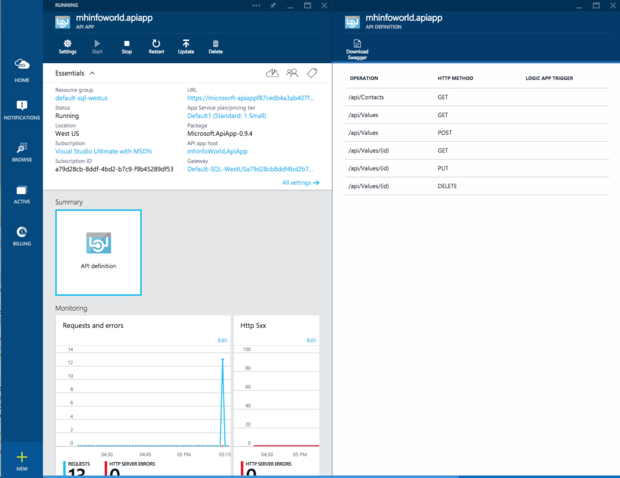 Azure App Service, a managed service currently in preview, integrates the Microsoft Azure Websites, Mobile Services, and BizTalk Services into a single service, and it adds new capabilities enabling integration with on-premises or cloud systems. It includes the tools and services needed to build four app types: Web Apps, Mobile Apps, API Apps, and Logic Apps (Figure 1). I’ll explain each of them below. App Service pricing varies from free to about $300 per App Service plan per month. The less expensive service tiers have fewer maximum instances, manual scaling, less storage, less RAM, and fewer cores. If you have a higher tier that allows multiple instances, you can easily enable and control autoscaling (Figure 2). You can change the tier of any service at any time. Note that turning off a service does not keep it from accruing charges, although reducing it to a free tier may if your data storage is less than 1GB. Deleting a service will certainly stop the meter. Figure 1. 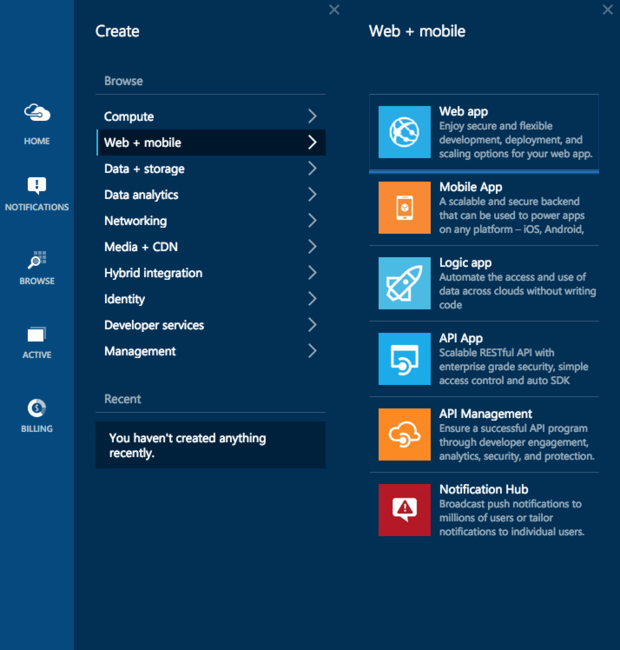 The new Azure Web and mobile app services offer scalable Web, device, logic, and API app back ends. The API Management and Notification services in this category are not new. Figure 2. If your app service is running in a tier that allows multiple instances, you can enable and tune its autoscaling so that it can respond to changes in demand. 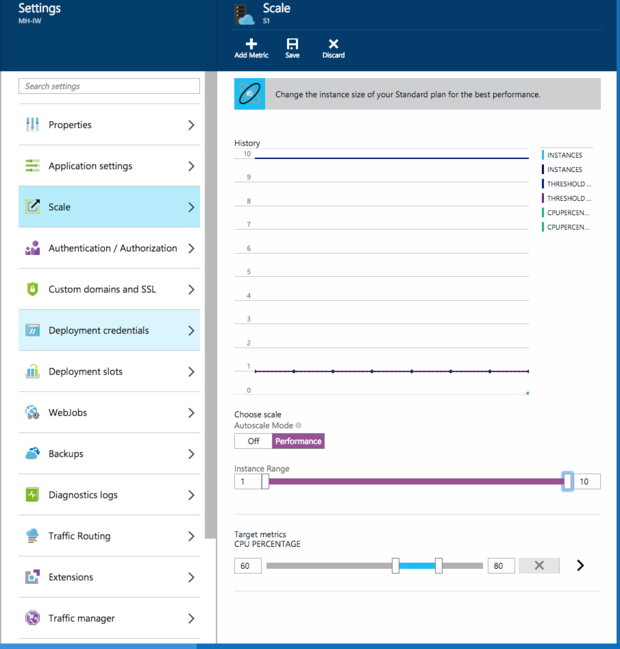 In my earlier review of Azure Mobile Services, I mentioned examining and building a starter To-do Azure Mobile Services app and back end. Mobile App Services have essentially the same starter app, only fewer back-end and client options are currently supported. The only back end is in C#/ASP.Net, and the only mobile platforms are Windows Phone, Objective-C/iOS, C#/Xamarin iOS, and C#/Xamarin Android (Figure 3). I didn’t encounter any build problems, though I had to update my Visual Studio 2013 and Xamarin installations for the latest Azure support. I noticed some features that used to be beta add-ons, such as disconnected operation and offline sync for iOS, have gone GA (general availability). Figure 3. 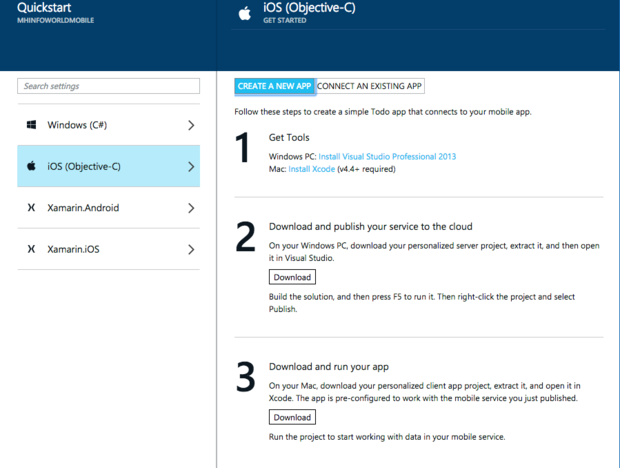 The preview of Azure Mobile App Services currently supports quick starts for four clients, reduced from 11 in the previous production Mobile Services. The demo apps themselves haven’t changed much. Figure 4. 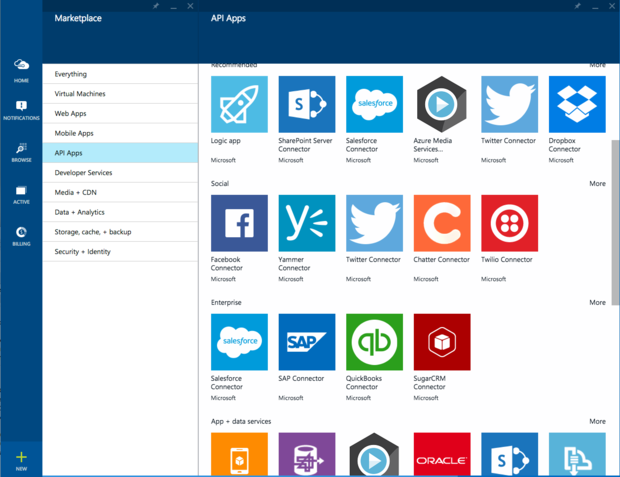 The Azure API App marketplace offers connectors to many common SaaS options, such as Salesforce, Twitter, and Dropbox. Figure 5. Azure API App Services create REST interfaces documented by Swagger. You can compose API App Services in a Logic App Service. The API App host takes care of managing authentication for the app, which saves you the headache of implementing it yourself. Otherwise, you can build your own REST interface on a Web App Service if you wish. I’m not clear on whether you can expose a REST/Swagger API to composition in Logic App Services if it’s built on a plain Web App Service. You clearly can if it’s running as an API App Service. Figure 6. 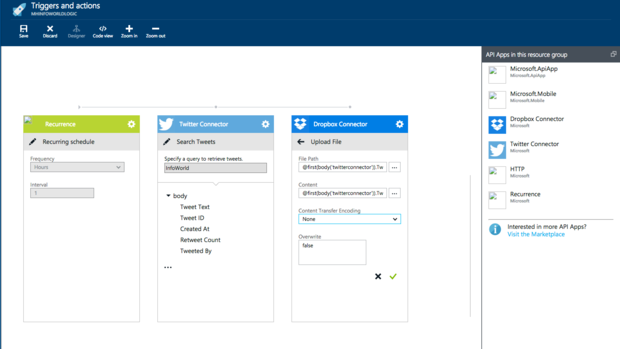 An Azure Logic App can visually compose Connectors and other API Apps into a business process. In this example, I set up a process to search Twitter for tweets about InfoWorld hourly, using my account, and save any tweets found into my Dropbox. The code view shows the generated XML for the process. Although beta around the edges, Azure App Services marks a new high in easing cloud-based, back-end service integration.